We all know that Ecotourism means sustainable nature based tourism. By definition it also means cultural tourism. 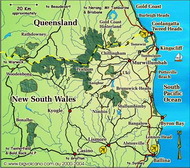 Murwillumbah is truly central to the natural and cultural assets of the World Heritage areas of the Wollumbin Caldera. Carmel Harris reckons it is central to cultural life of the region and a fine example of a truly rural town that has preserved its history and heritage. Carmel, as Co-ordinator of the Murwillumbah Mains Streets Project, is in a position to know. This project will see the main street become a leafy, pedestrian friendly avenue, with extensive restoration and integration of the historic architecture of the town. The entire town centre is involved, with upgrades of amenities and access linking the commercial, shopping and recreational areas of the town centre. Carmel tells us about the social centre of Murwillumbah. This elegant Art Deco town sits in the heart of the Tweed Caldera right at the junction of the network of rivers and roads that take you on your trek around. The town is virtually surrounded by four World Heritage national parks. 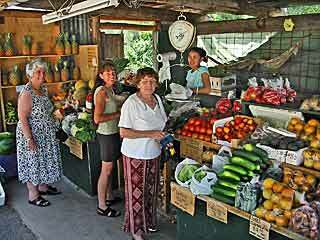 It is in the centre of a huge volcanic crater that cradles a diverse rural community. Murwillumbah is on the way to just about everywhere in the Tweed. The aboriginal inhabitants gave the name Murwillumbah, meaning Place of Many Possums, to this special place to express the abundance of food and the good things of life. 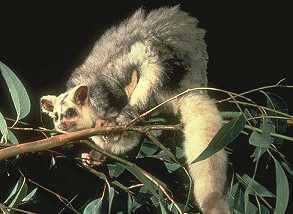 Possums are most often seen at night. To remind us and our visitors of our historical namesake, possums can now be seen in broad daylight, painted on colourful murals inside the shops and around the buildings of the town. The abundance of food and the good things of life are certainly here for you. You can 'do lunch' at an alfresco cafe, choosing from a wide variety of locations and an international cuisine. You can check in to your accommodation and check out the half dozen pubs and clubs. Enjoy the glow of an evening fire reflecting on rich timber panelling. Lunch on a riverside verandah, watching the reflections of Mt. Warning and the ospreys fishing the depths. Tuck into generous country cuisine and its traditional atmosphere. Chances are, that your meal will come from the work of the farmers out in the paddocks and on the hills of the Tweed Caldera. You will know all this just from the small and large trucks on the roads. There will be sugar cane trucks on their way to the mill, cattle trucks on their way to the saleyard, trucks piled high with boxes of fresh fruit and vegies on their way to market. There will be shiny silver milk tankers taking milk from the farm gate so it can return to your plate in the form of delicious cheeses or cool smooth ice cream. If the good things in your life include music, just check the venues for world class jazz, folk, blues and country sounds. For aficionados of classical music there's an annual Concert Series in early spring at the acoustically famous Tyalgum Literary Institute. Murwillumbah's creative locals produce a wide variety of good things to buy from the shops, galleries and markets and it's all there on offer with genuine country style and friendliness. One of the elements that sets a town or city apart from the modern inventions of architecture and big business, known as shopping centres or resorts, is the quirky reality of the old 'back lanes and alleyways'. Experienced travellers say they can measure the soul of a place by the nature of its back alleys. When you take a stroll down Proudfoot's Lane for example, you will see that people are friendly and you're welcome to come and go via the back door. You can still hear the sound of craftsmen tapping away and smell the bakehouse aromas of fresh yeasty breads and pastries. Further on the stacks of hay bales and bags of chook food give you the aromas of the countryside. This lane meanders from the straight and narrow because Lavender Creek is now confined underground, as it makes its way to the Tweed River. As the traditional service town for the Tweed, you will find all your shopping needs in easy walking distance as well as a host of medical, professional, technical and business services to suit the tastes of every Tweed Trekkie. Photos: Possum, Roadside farm stall © by David Palmer.